Eight persons-A, B, C, D, E, F, G and H are sitting around the circular table, but not necessarily in the same order. Some of them facing center while some of them facing outside. Each of them likes different professions, viz. 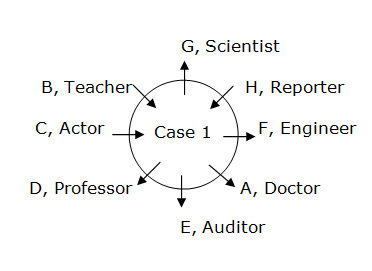 Engineer, Doctor, Teacher, Reporter, Auditor, Scientist, Actor, and Professor, but not necessarily in the same order. The one who likes Professor sits immediate right of E who faces outside of the circle. Only three persons sit between C and the one person who likes Engineer. Only two persons sit between E and B. The immediate neighbours of B faces opposite directions. G likes Scientist and does not sit adjacent to E. The person who likes Professor sits second to the right of B. C does not like Doctor. The immediate neighbours of G faces same direction. E likes Auditor and sits second to the right of C. A and D are faces same direction. The one who likes Engineer faces outside of the circle. H likes Reporter. F sits immediate left of A. H sits third to the left of C. B likes Teacher. 1. How many persons sit between the one who likes Doctor and B? The one who likes Professor sits immediate right of E who faces outward of the circle. 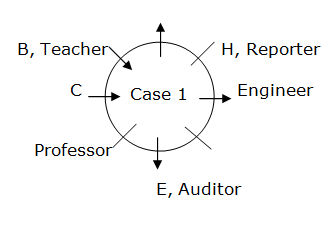 Only two persons sit between E and B.
E likes Auditor and sits second to the right of C.
The person who likes Professor sits second to the right of B. Only three persons sit between C and the one person who likes Engineer. The one who likes Engineer faces outside of the circle. H sits third to the left of C.
The immediate neighbours of B faces opposite directions. G likes Scientist and does not sit adjacent to E.
C does not like Doctor. The immediate neighbours of G faces same direction. A and D are faces same direction. F sits immediate left of A. 2. Who among the following likes Actor? 3. What is the position of D with respect to the one who likes Scientist? 5. How many persons are facing center of the table? Eight friends-S, T, U, V, W, X, Y and Z are sitting in a straight line facing north. Each of them likes different subjects, viz. Hindi, English, Mathematics, Botany, Biology, Physics, Chemistry and History, but not necessarily in the same order. S sits at the extreme ends of the line. W does not like Biology. Only one person sits between X and the one who likes Chemistry. Only three persons sit between U and the one who likes History. Z sits to the immediate left of the one who likes Biology. T sits third to the left of Z. The one who likes History sits to the immediate right of X. Y and W is an immediate neighbours. The one who likes Biology sits one of the left of U. The one who likes English is an immediate neighbour of the one who likes Hindi and the one who likes Botany. Only three persons sit between the one who likes Mathematics and the one who likes Botany. U does not like English. Only three persons sit between S and the one who likes Chemistry. Only one person sits between U and the one who likes Biology. S sits at the extreme ends of the line. Only three persons sit between S and the one who likes Chemistry. 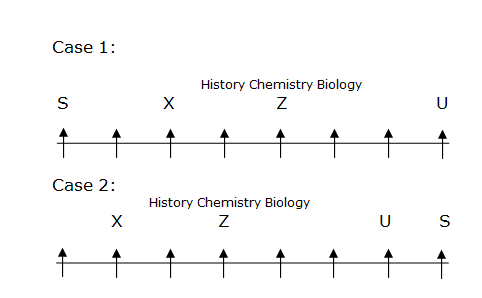 Only one person sits between X and the one who likes Chemistry. The one who likes History sits to the immediate right of X. Only three persons sit between U and the one who likes History. Only one person sits between U and the one who likes Biology. The one who likes Biology sits one of the left of U. Z sits to the immediate left of the one who likes Biology. T sits third to the left of Z.
Y and W is an immediate neighbours. W does not likes Biology. The one who likes English is an immediate neighbour of the one who likes Hindi and the one who likes Botany. Only three persons sit between the one who likes Mathematics and the one who likes Botany. U does not like English. 7. How many persons sit between S and U? 8. Who among the following likes Mathematics? 9. What is the position of V with respect to the one who likes Physics? 10. U likes which of the following subjects? 1)How many persons sit between the one who likes Doctor and B? 2)Who among the following likes Actor? 3)What is the position of D with respect to the one who likes Scientist? 5) How many persons are facing center of the table? 6) Which of the following combinations is correct? 7) How many persons sit between S and U? 8) Who among the following likes Mathematics? 9) What is the position of V with respect to the one who likes Physics? 10) U likes which of the following subjects?